Harvests in late spring/early summer - stores into fall. This Turban garlic originated in Turkmenistan, one of those small, mountainous Islamic republics near Chechnia that used to be in the Soviet Union. Not a particularly large garlic but a beautifully colorful one that harvests very early in the season. They form hardnecks and have lots of purple in rather flaky outer bulb wrappers that are easy to peel. The cloves are tannish with purple stripes on a purplish blush background and with slightly elongated tips. The bulbs contain an average of six cloves in a circular pattern and have no small internal cloves. The taste is medium strong, leaning toward being bold, but not overpowering. They have what seems to be a concentrated taste with very good character that makes them very appealing to the tongue as well as the eye. 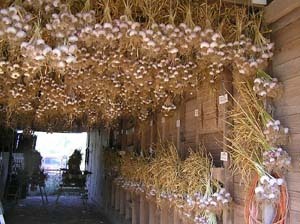 They are an attractive, early, tasty garlic that stores well but not real long as they want to get back into the ground by October and tend to sprout in the early fall.